The current SUPERPRO Website is being updated and will be relaunched in late April 2017. The ultimate dampproof coating. It can be sprayed to any thickness, covering over imperfections and providing a nice consistant coating. It can be applied to ICF's wood foundations. 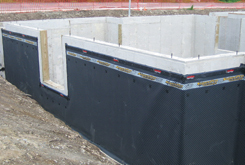 is an extremely durable, inexpensive and easy to use waterproofing membrane. 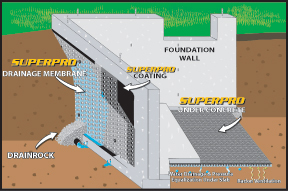 It is primarily used for exterior waterproofing and interior wall drain applications. SUPERPRO Bionic Pump. Unmatched in the market today. rubberized elastomeric spray applied membrane. It's sets instantly, is solvent free, has excellent strength, elasticity and adhesion.